The space shuttle Endeavour* is scheduled to blast off this afternoon at 3:47 EDT. It will be the second-to-last launch before NASA retires their shuttle fleet for good. The shuttle's commander, Mark Kelly, has spent much of the last few months at the bedside of his wife, senator Gabrielle Giffords, while she recovers from being shot in the head. It's been a long countdown, to say the least. University of Florida scientist Jamie Foster is leading the project, which will study the development of squid embryos in the near-zero gravity of spaceflight. Her Squids in Space team also includes college students and high schoolers who, one hopes, appreciate that they are doing the coolest class project ever. Foster's concern isn't really about the squid or squids, though; her research interest is bacteria. "Animals, including humans, are walking (or swimming) microbial ecosystems that interact daily with billions of microbes," she said in a press report. Humans' most important microbial interaction is with the bacteria that line our guts. But the Hawaiian bobtail squid, Euprymna scolopes, utilizes bacteria differently: as soon as it hatches, it absorbs a glow-in-the-dark species of bacteria from the water around it. The bacteria, Vibrio fischeri, lend the squid their bioluminescence. 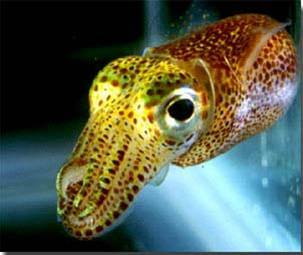 The squid houses the bacteria in a light organ on its body, and their glow obscures the squid's silhouette to predators lurking below. What happens when squid embryos hatch into a low-gravity environment? "The effects of microgravity on these mutualistic associations are yet unknown," Foster said. In space, "Do good bacteria go bad?" When applied to cephalopods on a shuttle, the question has a bit of a goofy, Snakes on a Plane feel. But it's a question with serious health implications for human astronauts--whatever they're doing after the shuttles are retired. What will they be doing, anyway? I've especially wondered about this since so many MUSE readers are space aficionados. Actually, "aficionado" might be putting it gently. One reader wrote online that she's observing today's launch by plastering her school with posters, wearing a special shuttle-launch outfit, and handing out cards to her fellow high schoolers. Some of our readers want desperately to be involved in the space program when they're older, even though they have no idea what that program will look like in 20 or 30 years. So I'm hoping to pose the question to Mark Kelly himself and put his answer in the magazine. PBS is doing a live interview with the shuttle commander on Monday, and they're inviting questions from the public through their YouTube channel. Some of the questions with the most votes will be read during the interview (leaving out, I assume, the many iterations of "have u ever seen a ufo on ur flights, thx, anonymous"). I posted my question online, and if you'd like to vote for it, you can find it by clicking here, scrolling down to the search bar on the right-hand side of the screen, and entering "muse." Voting ends tomorrow night. UPDATE, MAY 2: Thanks so much for your votes! My question ended up as the top rated in the "Students and Classrooms" category, which included some cute video questions from kids (who will probably get chosen anyway) as well as some hard-hitting journalistic questions ("just plz hear me out was the landing on the moon fake im relly wANT TO KNOW"). Meanwhile, NASA has again delayed the shuttle launch, this time until at least May 8. The astronauts have been sent back to Houston for more training. No word yet on the squid. *Why the British spelling that makes your computer send up squiggly red underlines everywhere? The shuttle, christened in a nationwide student contest, is named after a ship sailed by James Cook. Even NASA has found the British affectation tricky at times; they misspelled the name of the shuttle on a giant launchpad sign in 2007.